Today I share Lori's Swan Blessing story of the 'weaving healer'. Ever since returning from Cornwall last year where I was given my first hagstone that I carried with me through Ireland and Scotland I began to feel a deepening of the Swan Blessing work. In honour of these magical stones that feature a hole made by the elements wind and water and were rumoured to show the 'otherworld' when looked through, I created new Swan Blessing sessions called The Hagstone. The focus of these sessions was to unblock or recover our own way of seeing into the unknown and receiving a healing vision that will not only give us answers about the past but help us to put our natural gifts to work again in our present lives. Even if these gifts are not understood by everyone and especially if we hold a wound about them being shut down as children, these gifts belong to us and they are beautiful and need an expression in the world again. 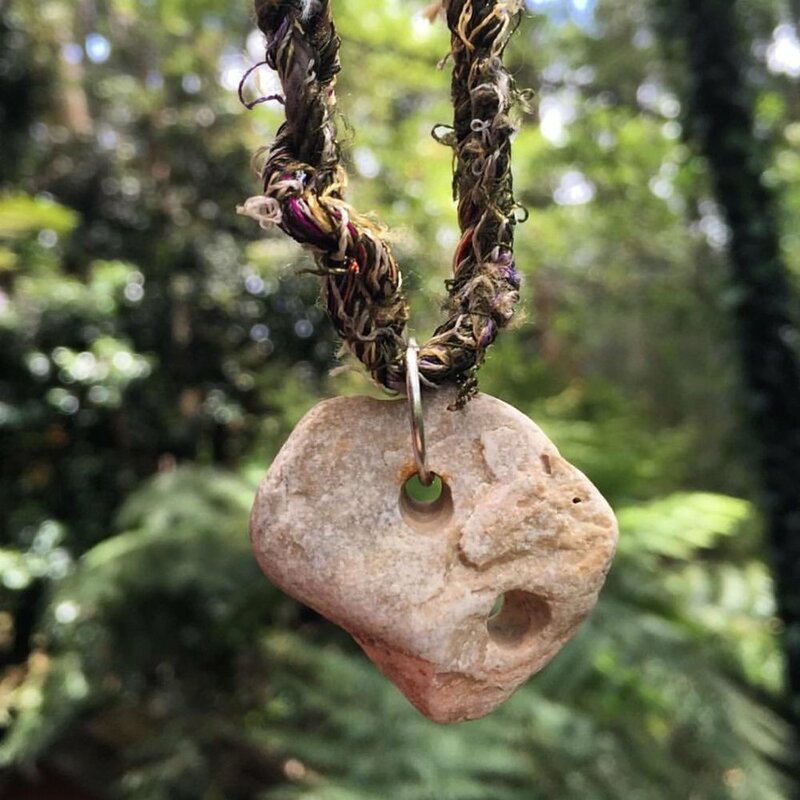 With all Hagstone sessions I ask the one seeking a vision to prepare in the days before by recalling a time in childhood when they felt completely magical and open to their gifts and shared them happily with others. Once this has been remembered we look at how and why these gifts came to be seen as wrong or even almost a secret. Lori had contacted me with the intention to 'connect fully to my creative spirit'. She remembered that as a child she had loved being a storyteller and was good at it but there was now some kind of fear or anxiety around expression or trying to write about what is sacred. I opened and held space for Lori so that we could journey together and see where and why her voice been silenced? This is Lori's Swan journey to find the weaving healer and uncover the hole in the stone. "My first Swan Blessing was almost a year and a half ago. It was a particularly visual journey and felt easy to write. Since that time, I’ve undergone a few deep initiations and find myself at another crossroad, deeper into my path. My inside voice said it was time to sit with Julia again. For some reason, the story of my Hag Stone Blessing doesn’t feel easy to write. It was a far more “feeling/sensing” journey than a visual one this time. I was releasing a few profound pieces the night Julia and I gathered for the blessing (unbeknownst to Julia.) The process brought on immediate physical release and healing. For these reasons, this blessing feels far more personal. I am going to push through this uneasiness, though, and just write the story because it’s part of the healing. My intention for this blessing was to fully open my gift of connecting to the language of nature ~ to fully connect to my creative spirit. When we entered the blessing space, I was reminded of my gift for writing stories and how it bridged the distance for my child-self when we moved away from my favourite magical place (“the lake”) and my favourite magical people (my maternal grandparents.) I was reminded how my maternal grandmother used to tell me stories and how I got lost in the magic of those tales ~ how I could literally FEEL the magic. “Magic”, to me, is a kind of full feeling that comes either into my head first or my heart. It feels like absolutely anything is possible ~ like doors you never knew were there are opening. It fills my body and sets off all the lights in my brain, like a beautiful symphony of fireworks. It’s the fuel of living beauty and when it flows, perspectives may be shifted, wounds may be healed and lives may be changed. Julia guided me to the well. I looked in and saw a woman moving up through the water. She had the brightest green eyes and long, blonde hair. I didn’t recognise her. Julia asked me, “who do you see?” I was having difficulty because I didn’t know who I was seeing, but the woman kept staring at me with smiles and mischief in her eyes. I was about to tell Julia that I didn’t know who I was seeing when I was filled with a powerful feeling, beginning in my heart - one I knew inside and out. It was the spirit of magic. The woman was me in another lifetime. She took me into her realm and as we walked the footpath through the forest to her home, she was talking aloud in an almost sing-song voice. Many forest animals came running to her and she put her hand out to greet them. She lived in a small, white stone cottage filled with a welcoming spirit. Every part of this place was infused with a sense of peace, of grace, of being found ~ a place where a person could finally put down their troubles and find solace. It was a bright place filled with jars of delicious things, threads, brushes, cloth, and supplies for all kinds of needlework. A big fire was burning brightly in the fireplace and there was a pot hanging over the flames. There was a full picture window that spanned the length of the front of the cottage. To the right of the fireplace was a wall full of shelves. The shelves were full of wool ~ some raw, some spun. Then I saw a beautiful spinning wheel and a loom. Women would come to her for healing. One by one. She sat them down in a chair and stood behind them, not touching them, but close enough that they could feel her comforting presence. She did this until she could sense they had settled into themselves. She placed her hands on their shoulders and, with the movements of her hands, began to settle whatever was troubling them ~ to bring healing, moving from the upper back of the woman and ending by placing a hand over the heart place. The women were completely at peace in the chair. As they sat in their solace, she would move to her wheel and spin wool ~ putting into it the particular healing for the woman she had just laid hands on. Once the wool was spun, she worked needles or her loom to create a healing shawl for the woman, so that she could carry her healing wherever she went. Everyone who came to see her for healing loved her. They felt seen. They felt understood. The healing work went on uninterrupted until one day, a woman turned up on her doorstep not wanting healing, but to apprentice with her. The woman appeared earnest in her desire, so the weaving healer woman wholeheartedly shared all the ways of her practice. I was then shown the woman on the doorstep had 2 faces: one of an attentive student and one of a backstabbing gossip monger. The woman used everything the weaving healer had shared with her to discredit her work and mock her gift. She painted her as an insane, dangerous woman, she warned people away from her. At that moment, I saw a dark, clay wall build around the weaving healer ~ her heart was broken. From then on, she only allowed herself the smallest space for her gift ~ shared only with herself. She would sometimes let it out a bit further, but would always recoil with fear and grief. The animals in the forest, however, remained loyal to her. At the moment of healing in this story, the weaving healer and I switched places. I was encased in dark clay and she was bright and free again. The Daughter of the Well gave me a copper hammer and I smashed the clay tomb around me into a million bits of dust. As the tomb smashed, I saw all the women who the weaving healer had helped - making their way through the forest - each wearing their healing shawls. This gift of the weaving healer is no longer choked in me like a tiny trickle of water in a dried-up riverbed. This gift of the weaving healer, this spirit of magic, is now a flowing torrent that runs freely through my veins. The star grandmothers have blessed me and I am free to allow the healing spirit of magic, to allow the fuel of living beauty, to flow through me and my work, unfettered. I am happy to say that Lori's ancestral memory of weaving, spinning and knitting with love and intention is very much alive in her life again and you can see her beautiful work as Swurlygirl Working Wool. I will watch with great curiosity as Lori also makes way for her stories to emerge to be shared again too now that she has given herself permission to share them again with others. Thank you so much Lori I'm putting my name down for one of those healing shawls when they are ready to return.